An international team of scientists is a step closer to producing higher protein, better quality wheat and barley. That’s a potential boon for Montana’s beleaguered farmers, hit by commodity prices so low in recent years many are wondering how they’re going to survive. As Sarah Kanter Brown reports, it all starts with Montana State University’s first Plant Sciences Endowed Chair. Hikmet Budak, MSU professor and Montana Plant Sciences Endowed Chair in the Department of Plant Sciences and Plant Pathology, is seen here on Friday, July 8, 2016, at the MSU Post Farm in Bozeman, Montana. Budak recently collaborated with a team of international researchers on sequencing the genome of durum wheat, a staple ingredient in pasta. “I think we actually got the best individual in the entire world,” said Montana Department of Agriculture Director Ron de Yong. 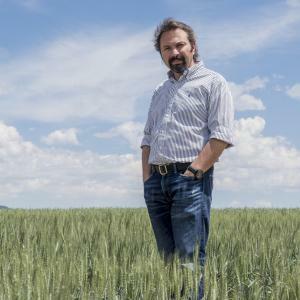 He and others in Montana’s close-knit ag world are positively giddy about the internationally-recognized plant scientist, who arrived in Bozeman from his native Turkey in January. Budak is one of a 14-member team who this summer sequenced and mapped the genome – or complete genetic code – of durum wheat. Durum is a close relative of the more widely-grown bread wheat. It’s the source of semolina, the key ingredient in pasta. The data was generated using technology developed by genetics company NRGene. The company collaborated with MSU, as well as The Council for Agricultural Research and Economics, the National Research of Italy, the Crop Development Centre of the University of Saskatchewan, the University of Tel Aviv, the University of Bologna and the IPK Gatersleben. According to the Montana Department of Agriculture, Durum wheat represents just 14 percent of the six million acres of wheat grown annually in Montana. But that’s 14 percent of a nearly $1 billion industry. And it could be worth a lot more. Now the durum wheat genome has been sequenced, researchers can more efficiently improve the crop, more quickly creating ‘elite’ cultivars, cultivated varieties with desirable traits like high yield, high protein, pest, drought and disease resistance. A better quality crop would up its cash value considerably, said de Yong. It would also act as a kind of road map for further cereal crop genome sequencing. That means more and better Montana-adapted lines of wheat and barley. And it’s not a moment too soon. Although farmers in Montana and around the world had a bumper harvest this year, grain prices are rock bottom. Wheat got as low as $2.16 a bushel this year, a far cry from the almost $9 a bushel earned between 2011 and 2014, according to the Chicago Board of Trade. Barley’s not much better, with next spring’s contracts likely to be on the low end of the range Montana producers have seen the last two years – something like $4.50 to $5.25 a bushel, said Montana Wheat & Barley Committee Trade and Marketing Manager Cassidy Marn. It’s not just the economic angst that has farmers in a twist. It’s the environmental uncertainty. This is where MSU’s plant celebrity Hikmet Budak comes in. “Number one is that the global warming issue and climate change,” Budak said. Climate change will increase drought and carbon dioxide, stressing plants. It may usher in more disease, blight or pests like economically-ruinous wheat stem sawfly. “Number two is that the population is increasing really much,” Budak said. The burgeoning global population makes developing high-yielding varieties imperative. The world has to eat. Number three is the protein issue. Basically, cereals don’t have much, even durum, a more nutritious form of wheat than some. “In order to have higher quality of food we need to increase the protein but also micronutrients as well like zinc and iron,” Budak said. He actively collaborates with cereal grain producers and industry types like breeders, entomologists and plant pathologists. More than 60 Montana grain producers and several agribusinesses support his chair. That payback’s in the form of high quality Montana cultivars that could be a life line for cash-strapped Montana producers.